I have to admit that winter isn’t the busiest time in the forest garden. It’s based on perennial plants and most of these have evolved ways of keeping their heads down during the cold season. Herbaceous perennials sacrifice their above-ground parts completely and die back to roots, tubers, corms and bulbs. Trees and shrubs lose their leaves and overwinter as stark, bare wood. The few species that keep their foliage over the winter months have leaves that are tough, prickly, chemically defended and decidedly not edible. That means that all the action is in the ground layer, with the few plants – annual, biennial and perennial – that have adopted the strategy of toughing out the snow and ice in return for the reward of snatching some winter sunshine while the canopy layer isn’t using it. The stars of the winter plants are the cabbage family, with many familiar annually-grown veg, from Christmas’s Brussels sprouts to spring’s sprouting broccoli. The perennial members of the family are less well known: nine-star perennial broccoli (Brassica oleracea botrytis aparagoides) just barely makes it into the perennial category, rarely lasting more than three years, but it’s worth growing, as much for its winter production of leaves sweet enough for salads as for its cauliflower-like sprouts in spring; Daubenton’s kale (Brassica oleracea ramosa) is a more genuine perennial kale, which can be used in all the same ways as annual kale. 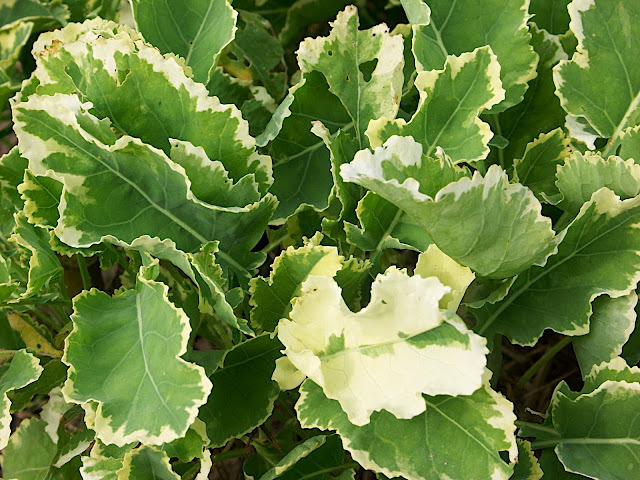 Daubenton’s kale has an extremely attractive variegated-fringed version which could take a place in the flowerbed on merit. A more distantly related member of the same family, land cress (Barbarea verna) is a low-growing weedy-looking cress that seems to relish the winter months. It is like an easy-to grow version of watercress with most of the same uses. I find it a bit too much in salads, but I know people who love it. My favourite use is to make a potato soup and then blend in some land cress at the last minute for land cress soup. Land cress puts up with a fair degree of shade and if you let it self seed you will never be short of it. A pretty, large-leaved, variegated version seems to have established itself in my garden. Rocket (Eruca vesicaria sativa) can be treated in the same way and is productive with me in all but the worst winters. It grows like a weed and I’m always amazed at how much supermarkets get away with charging for it. Most alliums die down over the winter, but everlasting onion (Allium cepa Perutile) just soldiers on, providing onion tops in all but the worst weather. Alternatively you can dig up and divide a clump, using them just like spring onions. Some species that are unpalateable in the summer grow more succulent in the winter, when they don’t need hairy leaves to protect against slugs and insects. Serbian bellflower (Campanula poscharskyana) is one that is finding its way into our salad bowl at this time of year. So too are the various primroses: cowslip, oxlip and primrose (Primula spp). They are mostly in the garden for colour and wildlife value, but they are also a fairly abundant source of succulent little leaves at this time of year. Finally, a few things to jazz up a salad. The French sorrel (Rumex acetosa) has died down, but smaller-leaved, hardier, local varieties of the same species are still producing a crop of lemony-sour leaves. Traditional winter herbs such as curled parsley are hanging on in there too. Sweet cicely (Myrrhis odorata) is venturing the occasional aniseed-flavoured leaf. And for those who like it fiery, the wasabi-flavoured native plant dittander (Lepidium latifolium) is still in production. This entry was posted in Log, Species and tagged cooking, forest garden, gardening, plants, scotland. Bookmark the permalink. I’m so glad to have found your blog, and this post in particular! I had no idea there were perennial brassicas. These are absolute must-tries. (I wonder if I can get seed in time for this year…) Right now I am mostly an annual vegetable gardener, but I have the ambition to move into perennials where I can. Your site will be a definite resource for me! Thanks for all the great information. Great! Thanks so much for the additional information. Cetranthus ruber (red valerian) seems to have edible leaves pretty much all year round, here on the south coast. Do you use them much? I always find them a bit bitter.